Echolocation sounds of Rhinolophus ferrumequinum nippon as they approached a fluttering moth (Goniocraspidum pryeri) were investigated using an on-board telemetry microphone (Telemike). In 40 % of the successful moth-capture flights, the moth exhibited distinctive evasive flight behavior, but the bat pursued the moth by following its flight path. When the distance to the moth was approximately 3–4 m, the bats increased the duration of the pulses to 65–95 ms, which is 2–3 times longer than those during landing flight (30–40 ms). The mean of 5.8 long pulses were emitted before the final buzz phase of moth capture, without strengthening the sound pressure level. The mean duration of long pulses (79.9 ± 7.9 ms) corresponded to three times the fluttering period of G. pryeri (26.5 × 3 = 79.5 ms). 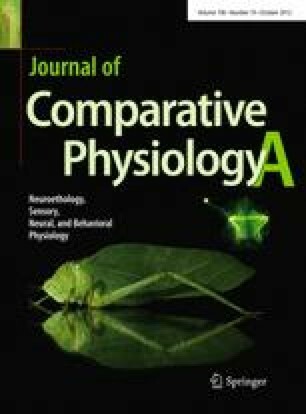 These findings indicate that the bats adjust the pulse duration to increase the number of temporal repetitions of fluttering information rather than to produce more intense sonar sounds to receive fine insect echoes. The bats exhibited Doppler-shift compensation for echoes returning from large static objects ahead, but not for echoes from target moths, even though the bats were focused on capturing the moths. Furthermore, the echoes of the Telemike recordings from target moths showed spectral glints of approximately 1–1.5 kHz caused by the fluttering of the moths but not amplitude glints because of the highly acoustical attenuation of ultrasound in the air, suggesting that spectral information may be more robust than amplitude information in echoes during moth capturing flight. These experiments complied with the Principles of Animal Care, publication no. 86-23, revised in 1985, of the National Institutes of Health, and with current Japanese laws. All experiments were approved by the Animal Experiment Committee at Doshisha University. We thank Dr. Takuma Takanashi and Dr. Ryo Nakano for their valuable support launching this study. We also thank James A Simmons and Andrea M Simmons for comments on previous versions of the manuscript, and Nobutaka Urano for assistance in capturing bats in the field. This work was partly supported by a Grant-in-Aid for Scientific Research on Innovative Areas (Grant No. 20200055), a Grant-in-Aid for Young Scientists (B) (Grant No. 21760318) of Japan Society for the Promotion of Science (JSPS), and an Office of Naval Research (ONR) grant (Grant No. 00014-07-1-0858).